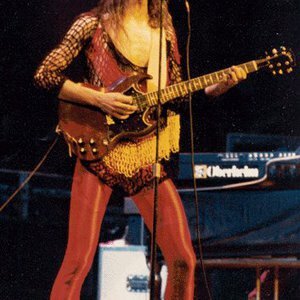 Joseph Kim Mitchell (born 1952 in Sarnia, Ontario) is a Canadian guitarist, songwriter and radio DJ personality. During the 1970s, while still in his teens, Mitchell began playing with local bands in Sarnia. After evolving through a few name changes with essentially the same band, Mitchell and "Zooom" headed off for Toronto, Ontario. Zooom eventually dissolved, with Mitchell travelling to the Greek islands. During the 1970s, while still in his teens, Mitchell began playing with local bands in Sarnia. After evolving through a few name changes with essentially the same band, Mitchell and "Zooom" headed off for Toronto, Ontario. Zooom eventually dissolved, with Mitchell travelling to the Greek islands. On his return to Canada, he formed the band Max Webster and wrote most of the band's songs with fellow Sarnia native and lyricist, Pye Dubois (Paul Woods). Max Webster toured extensively and built a string of hits. Mitchell's solo career began after his departure from Max Webster, with session work and a succession of solo albums. In early 1985, the song "Go For Soda" from the Akimbo Alogo album became an international hit and perhaps remains his best known song outside of his native Canada. In 2004, Mitchell entered the radio broadcasting industry, becoming afternoon drive time host on Toronto classic rock radio station Q107. As of 2005, Mitchell, still does the afternoon drive time on Q107, and is working on a new double CD set for a Spring 2006 release. In December of 2005, Mitchell had proposed to the Q107 listeners that they write a Christmas song together. The resulting song is entitled "A Christmas Smile". At the end of the song, Mitchell advises his fans not to drink and drive, but to "go for a soda" instead.